I have developed a strong relationship with and respect for bees over the past years, you’ll learn why below, I hope. If you eat honey, where is it from? Do you avoid buying foods that were sprayed with pesticides that harm the bees? I never realized how even just my own actions can make a huge difference when it comes to this, and your actions do too! I had the total honour to speak to my synagogue congregation this Rosh Hashanah morning about the bees. What an opportunity it was! I hope you will read what I said below, and that whether you celebrate your new years now, with honey, or not, that it resonates with you, and maybe it gets you to take your own action to save the bees. What better time to talk about how important bees are than on this holiday, where we all enjoy honey? Honey is a special food that was first mentioned in the Bible as one of the gifts sent by Jacob with his sons when they went down to Egypt to seek food during the famine. It was clearly a valuable and delicious commodity during Biblical times. Honey, besides being an incredible natural sweetener can even encourage healing and fight infection. It is truly a super food. Being so special, even sacred in Judaism, we should all understand and value where it comes from. It takes a lot of bees, a lot of work. 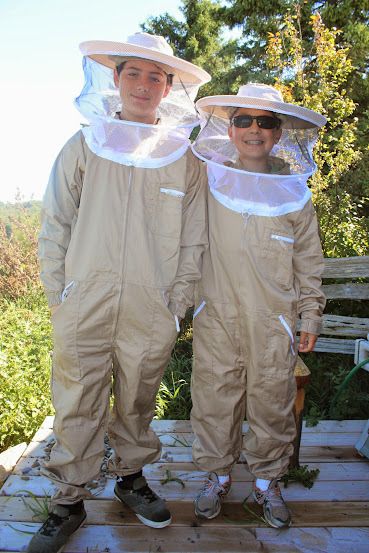 I recently learned a lot about the bee decline when researching for a school project, and later decided to donate to Shoresh Jewish Environmental Programs as part of my Bar Mitzvah last year, to try to help save the bees. Shoresh, a local Jewish environmental organization, says that they are committed to responding to contemporary food and environmental issues in any way they can. 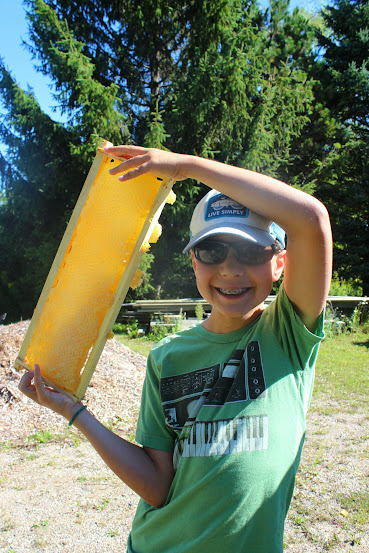 They currently have a farm about an hour Northwest of Toronto that has three bee colonies. 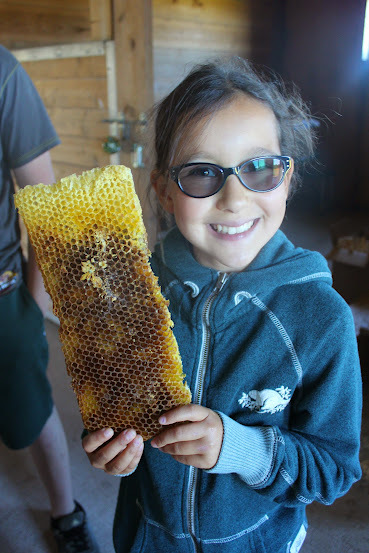 These bees are cared for well, trust me, I had the good fortune to see them first-hand and even participate in harvesting my own honey this year! The most common misconception about bees is that they are a threat to us, even dangerous, because they sting and often we swat and kill them. Please don’t. Bees are actually responsible for pollinating all flowering plants and approximately one-third of all food produced throughout the world. That’s ONE THIRD of ALL FOOD. The bees are highly susceptible to pesticides, so that is why the population is going down at an ever-steepening rate. Currently, there have been 150 different chemical residues found in bee pollen from pesticide use. Did you know that the European Union has several different laws banning pesticides? Laws that our government in Canada has barely considered, even knowing how harmful they are. 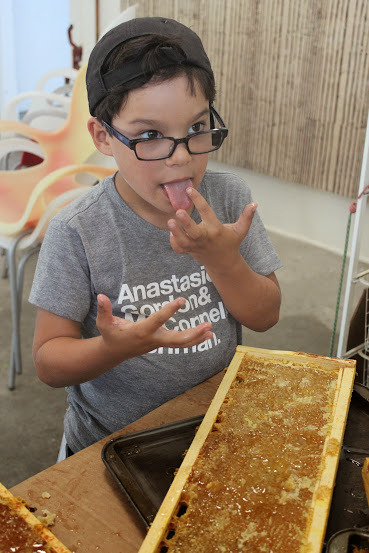 Honey symbolizes a sweet new year in Judaism, so without bees, does that mean the years will cease to be sweet? Not if we all take the time to understand this serious issue and decide to do something about it. You can do so much to save our bees, no matter how much time you have. Whether you sign a petition to ban pesticides, plant a diverse and pesticide-free garden at home, shop organically everywhere, you are helping, and even just your voice can make a HUGE difference! Let’s all count on each other to act on this starting TODAY, and share this real problem, and the solutions with our friends and families. Together, we can all save the bees, we need to. As we ask for a Shana Tova U’metuka — “May we have a good and sweet year” and as we dip apples into honey, let us think about our sweet year ahead, and how we can ensure that my kids, your kids and our kid’s kids will be able to do the same. 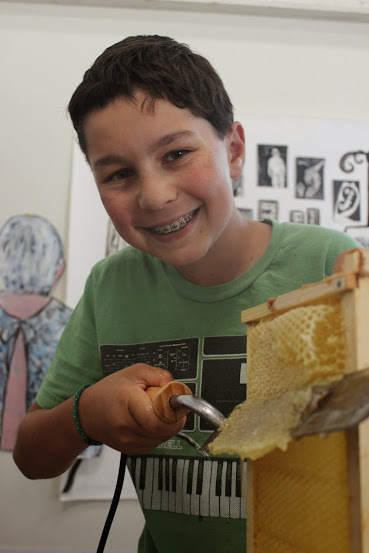 Please read this article in the Toronto Star this past week about ringing in a sweet new year with local honey and Shoresh, the organization that I supported for my Bar Mitzvah, and will continue to for time to come. My school Prezi and accompanying script on the bees. Just click here and scroll down to the second presentation. Please read the latest Shoresh newsletter that will inspire you – not just about the bees, but about their work, too. 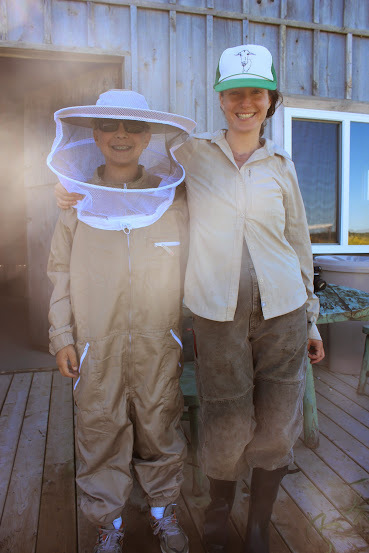 Please enjoy these pictures of my family, my longtime friend, Reuben, Sabrina from Shoresh, her friend Jo and Miley, a professional beekeeper who showed us all how to love bees a little more, and to not be afraid of them, when we went to Bela Farm to meet the bees and harvest this season’s honey.